Who knows what evil lurks in the hearts of artichokes? This title and catch phrase just cracked me up. This is the third in the Bunnicula series. It took only four days to read aloud, and my boys enjoyed it, but it isn’t quite the caliber of Howliday Inn, which isn’t quite the caliber of Bunnicula. In this one, Chester begins to wonder what happens to the vegetables the vampire bunny bites? Do they become vampires themselves. Are they plotting to take over all of Centerville? Could the Monroes (including Chester, Harold and the young pup, Howie) be in danger? It’s a great premise, but the humor in this one falls just a little flat in places, and the characters don’t quite play each other up as well as they did in the first two books. The plot gets a little wacky, too, when of the runaway pets are convince the school carnival is headquarters for the evil vegetables. But it is still cute and amusing. A short note here. Mr. Howe added a fun new character to this one. Howie, the puppy of Howard and Heather (the “werewolves” of Howliday Inn), has taken up residence with the Monroes. Young and wise-cracking, he adds a lot of life to this one by constantly provoking Chester. I thought there were only four books featuring the cast from Bunnicula, but Mr. Howe has become rather more prolific than that. There are actually seven—and a whole spin-off series featuring Howie the puppy. My boys and I took a vote. Should we read the next one? I already ordered it from the library. Yes, we agreed that we would, but I think there we will be done. * Any further adventures with Chester and Harold will have to be read on their own time. In conclusion, I’d still encourage you to meet these two extraordinary pets. They have real cat/dog characteristics as well as hilarious, well-developed and complimentary personalities. But if you’re only looking to dip your toe in their story, go with Bunnicula. It’s the best of the lot. *We did read the next book, Nighty-Nightmare, and the declining trend continued. Cute moments, but it’s not that great. I chose not to review it, and there I will end my relationship with Chester and Harold. Thanks, Michelle, for this thorough and honest review. I think that I will take your advice and start out with Bunnicula. Thanks again. You’re welcome, Tim. Yes, Bunnicula is well worth reading. That one is hysterical. I know my teacher has this in her class library (I am our class librarian [go figure] and saw the book a bunch of times). 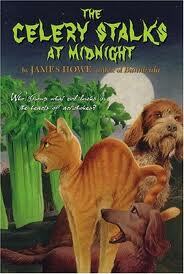 I will read Bunnicula first and if I like it, will continue the series! The cover had me — so expressive and engaging! Too bad it doesn’t quit meet up to Bunnicula. Glad to know. But, it does sound like a fun book. The new covers are great, aren’t they? It is cute, and it had my guys laughing, but it doesn’t really stand out in a crowd.